First dry roast urad flour in a pan for 1-2 minutes then remove from the stove and sift the flour and keep ready. Melt butter in a microwave safe bowl and keep ready. Take a wide bowl, add sifted rice flour, urad flour, dalia powder , salt, ajwain seeds, sesame seeds and mix everything well. After that add melted butter and combine with the flour well and then add enough water and knead it to a soft, pliable and non sticky dough. Once done, divide the dough into 10-12 equal parts to fill in the murukku press. 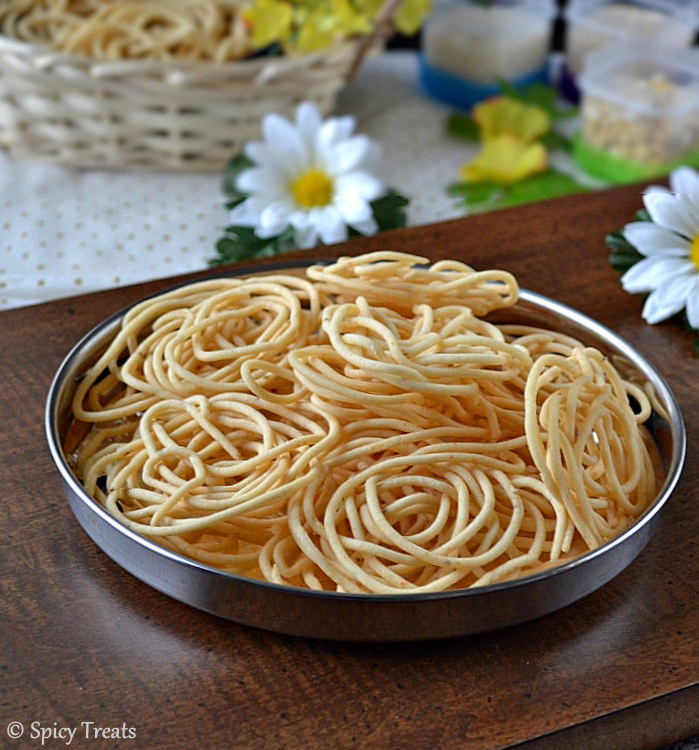 Grease murukku press/achu with oil and fill with one part of dough and close it tightly. For Thenkuzhal use 3 round plain achu/plate. (ref pic). take 2 or 3 ladle turn back side n squeeze roughly in circular motion( i directly squeezed the murukku in hot oil like ribbon pakoda or omapodi), when oil gets hot drop the shaped murukku and fry in medium hot oil till it turns light golden color and also the hissing sound n bubbling stops. adding ajwain seeds will gives nice taste n flavor to the murukku, so don't omit that...if u really don't like substitute with cumin seeds. 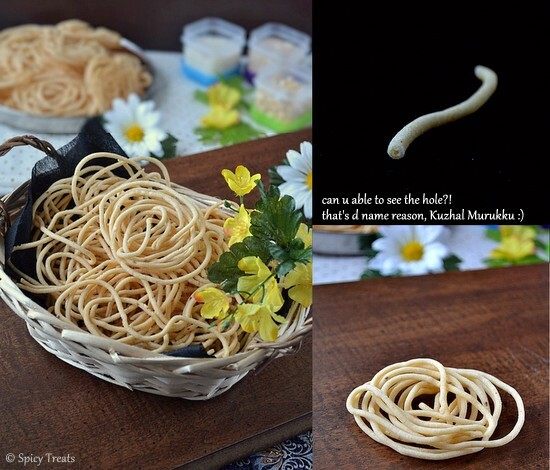 The color of Thenzkual murukku will be lighter than the other murukku becoz of urad dal flour n pottu kadalai maavu, the color above shown in the pic is the right and if u cook till dark golden brown then ur murukku will be hard crunchy. Instead of gram dal powder/pottu kadalai maavu u can also use kadalai maavu/gram flour that willgive u nice golden brown color. neat presentation and well explained.. Dropping here after a long time Sangee...I am loving these thenkuzhals. Love your step by step pics too. Your pictures are looking stunning dear. 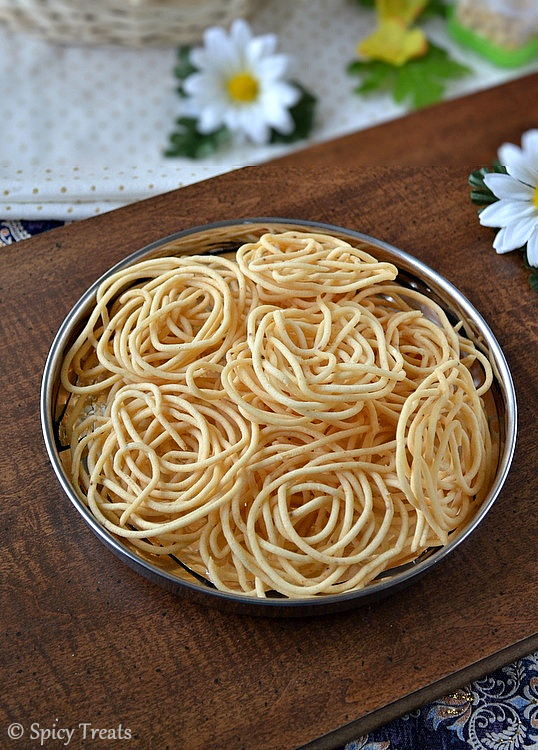 Prefect thenkuzhal, its been a long i made them, this diwali is going to be only with coconut milk murukku and par boiled rice murukku.Hope both A will be enjoying their mom's savouries thoroughly. Yummy.. like the nice light golden color of ur murukku. I came across your blog while searching for recipe..being a working mom and no experience at all on cooking so i decide to surf for recipes..all the while i only bake basic cakes ie butter cake, choco butter cake, choco steam cake..now i want to try other stuff like indian cooking since most of time either my mom or MIL will cook..i want to try on my own ur recipes are easy to under stand and guidance are fantastic..i gonna try to do all ur recipe every week..Good luck and all the best and keep the good yummy stuff coming more n more..
Acctually i wanna ask u wat is URUD Dhal..i dont know that..please tell me in tamil wats its called? Can i get everywhere?? If you have good blender, simply dry roast the 3/4 cup urad dal till light golden brown in medium heat. Then cool it for a while and blend it to a smooth powder, sift and use 1 cup flour. Hi yumm. Can we omit dalia as we dnt get here. It gives nice texture and taste to the murukku. But you can also try without it, in that case, add extra 2 or 3 tbsp of urad dal flour.